Our cottages are located on a quiet street – just three blocks from downtown Waitsburg, a historic, pedestrian-friendly town in beautiful wheat farming country. The cozy, welcoming cottages are perfect for couples or a group of friends. Visitors to wine country will find it especially convenient to return to a quiet, comfy home after a day of wine tasting. 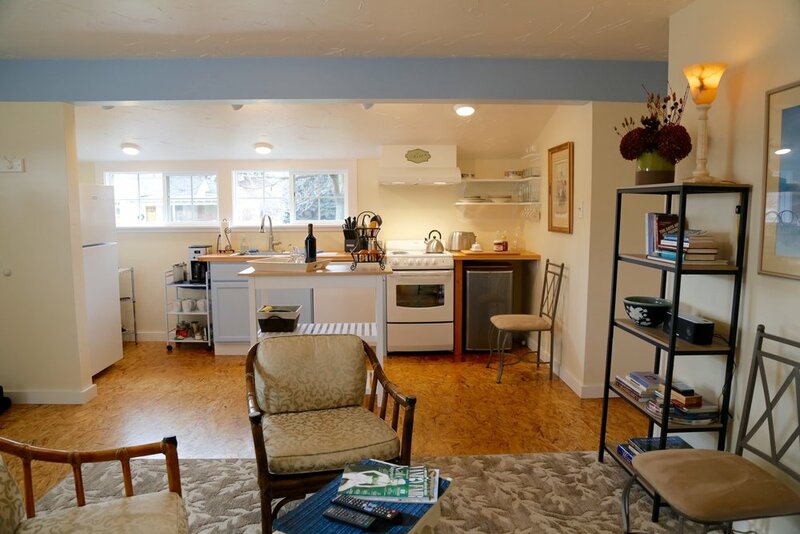 Here you may refresh and relax, and then walk to charming downtown Waitsburg, Bar-b-que, brew pub, family cafe or simply cook up a meal in your own kitchen or grill, with supplies from the nearby farmers' market and fromagerie. Guests receive a complementary selection of wine. PLEASE NOTE: We are listed on Airb&b, however, the cost for staying with us is higher if you use them!! Curious to hear what our guests have to say? Enjoy all the amenities of home. Entire house rental two couples max., one time 50.00 cleaning fee. Three Maples is located on a quiet street – just three blocks from downtown Waitsburg, a historic, pedestrian-friendly town in beautiful wheat farming country. The cozy, welcoming cottage is perfect for two couples, families of four, or simply to indulge you and that special person in a luxurious private nest for two. Completely refurbished, this century-old cottage has two private queen bedroom/bathroom suites, each with a clothing wall, and pillow-top, extra-deep mattresses. One bathroom has an extra-large tiled shower, the other a beautifully restored and luxurious 1929-vintage clawfoot bathtub with hand shower. Enjoy a fully-equipped kitchen with full size appliances, a laundry room, wi-fi and 1/3-acre, fenced and landscaped garden. This cottage features a heat pump system for ultra-quiet heat and cooling. Combining the Three Maples Cottage with the Bird House Mom-in-law, makes this an ideal destination for three couples. The Bird House is located on the Three Maples property, with a private entrance and parking area. The cozy, welcoming cottage is perfect as a single traveler's retreat, or a sweet nest for two. Combining the Bird House with the Three Maples cottage makes this an ideal destination for three couples. Originally an outbuilding on the homestead, it has been masterfully renovated to a one bedroom, one bath cottage. The bed has a pillow-top and extra-deep mattress for luxurious slumber, with adjacent bathroom suite that includes a generous shower. Enjoy all the comforts of home with a fully-equipped kitchen, laundry room, wi-fi, fenced and landscaped garden with a private patio.